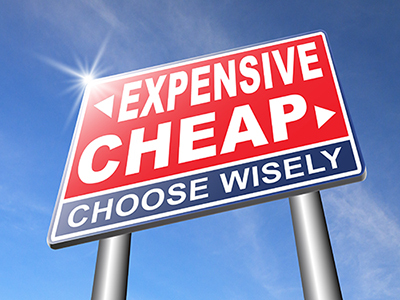 Cheap Website Design – Is it Worth It? Here’s a scenario for you to contemplate. You’re a business just starting out. You realize a website is a necessity but you’re on a limited budget and you don’t have a lot of money (or time) to spend. But right now in your mind you’re thinking Cheap Website Design. So here’sthe question for you. What’s your biggest concern? If saving money is the biggest factor for you then there are a few options available for you that might make sense. If ease of mind, lack of frustration, and high quality are concerns for you then there’s options too. Website Builder – (Typical Costs: $69-$100/yr) You can use a website builder through a hosting company like imsmb.com offers. With website builders you have to select from templates that might fit your needs. You will then fill in the words, possibly change some images in them, and launch your website. Pros – this is a cheap solution and will save you money. Template Design – (Typical Costs: $150-$495) You can obtain a template (like a WordPress theme) and have it modified. This is the next best money saving option for you. In this case a designer will help you select a theme to begin the basis of your website on and then will modify it for you. No layout or structure changes will be made. All the walls of the theme will stay in the same place as the theme you purchased but the theme will be modified to suit the your business specifically. Cons – it is not a custom design so you’ll have to settle for the general layout and look of the theme and features it offers (unless you pay for additional features to be added). You may also be stuck with some theme that incorporates plugins that can be either susceptible to hacking or incompatible with your site look/feel. Custom Web Design – (Typical Costs: $995-$5,000) This is a straight top to bottom custom build that does not require you to settle for anything. You’re able to get quoted what you want and know your pricing before starting it. Pros – you will get exactly what you want/like. You will also get to have recommendations from a designer who can tell you how visitors interact with a website and why it’s important to place certain things in certain positions, utilize certain colors on the site, and how to craft your website structure and flow. You can usually get e-commerce provided with custom design. Cons – you will most certainly pay more money for this than either of the other two options and it will take a bit longer to get done. This at least gives you a price range so you can understand what you get if you’re thinking to get cheap web design.